So how many days did you make it into summer break before your child said “I’m bored!”? Did you make it more than one day? Celebrate! 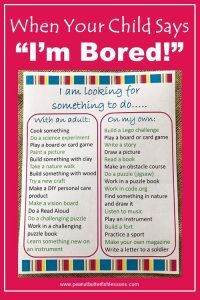 This year I am hanging a list up on our kitchen wall with activities so that when my children say “I’m bored….”, I can just say “go find something on the list.” You can print this list out for yourself at the bottom of this post. 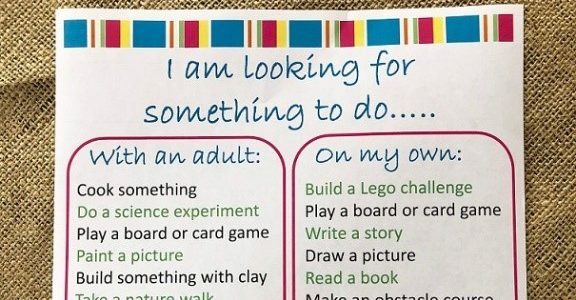 They are divided between activities that can be done alone and activities that require some level of adult supervision, depending on the age of your children and how tolerant you are of messes! It is helpful to also arm yourself with some supplies and resources. 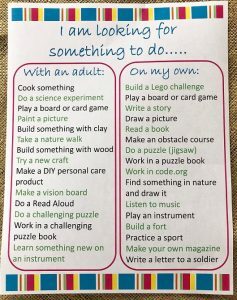 Here are some items you may want to have on hand and links to ideas for those of us that are creatively challenged at times. It is nice for children to do something else on the computer besides play games and watch videos! We like to work on our coding skills on Code.org and it is FREE so check it out! 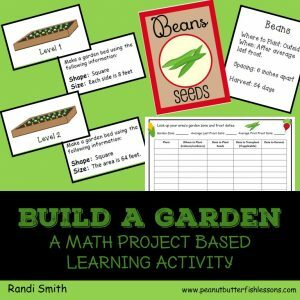 This could be a fun activity for your children to do with an adult, too!